Click HERE for the thread to see the rest of the images. Reminds me of those vintage images of 1969 Camaros on Don Yenkos lot! Check out this ebay gem! The first year the IROC option was offered. This car was recently liberated from 23 years of inside storage. The car has only 4.3 actual miles on the odometer. 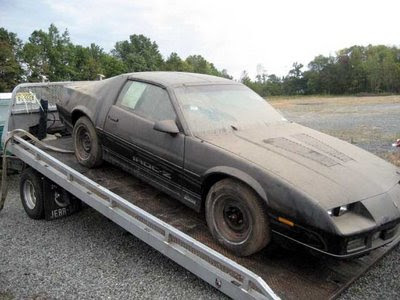 According to the original and only owner of this car, he purchased it new in 1985. The car was taken directly from the GM auto transporter and put into storage. This car was never dealer prepped, that is why all of the factory GM markings are still on the glass, mirrors and other parts of the car. The interior is still covered in the factory plastic as delivered to the dealer. The front air dam is still in it's sealed plastic wrapper along with mounting hardware in the back seat. These cars were transported without the air dam because they would get damaged coming off of the trailer. Installation would have been part of dealer prep. The rear cargo cover is in the box in the back seat, never having been installed. 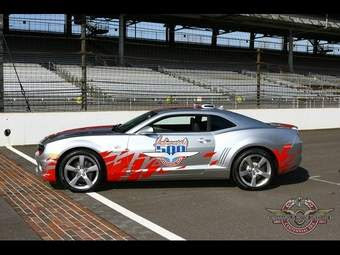 For the fifth time in Chevrolet history, the Camaro will pace the 2009 Indianapolis 500. This ends a five year reign held by the Chevrolet Corvette. The pace car will be a 2010 Camaro SS with a 426 hp 6.3-liter V8 and a the Tremec six-speed manual transmission. The ONLY modifications made to the pace car will be the addition of strobe lighting! The 427 Camaro Back With Its Version Of THE 2010 CamaroJust as the COPO option gave enthusiasts a back door to performance in 1969 with its factory 427cid engine, GM Performance Parts carries on this legacy with its hopped-up version of the 2010 Camaro SS. Starting, of course, by supplanting the LS3 for an LS7, GMPP was intent on creating the wildest fifth-gen to date while staying true to the Camaro's historic roots. Lucky for us, achieving extraordinary performance is possible while making so few deviations from the factory equipment, or in this case, GM products-albeit from the pages of the GMPP catalogue. The GMPP Camaro was originally part of an early run, and is actually not a production version so-to-speak, but "all of the components are production design," says GM Performance Division Project Manager Mike Copeland. It was originally black, and was repainted a more eye-catching red aside from the hood and rear panel, which were painted flat black in an ode to old school hot rodding. That of course is balanced nicely with the very new school Brembo 6-piston front and 4-piston rear brake upgrade to fill up the one-off 20-inch hoops. Meaty Pirelli P Zero 255/40R20 and 305/65R20 rubber accompanies them. It looks like Clayton Moore and Jerry Peluso are working with Chevrolet to develop a new Camaro commercial? A fan sent us a link to this clip on his site today, take a look for yourself! Don't forget to visit Clayton's site for some other samples of their work. 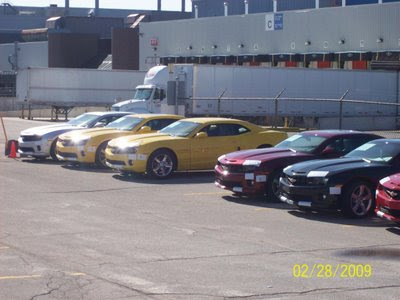 Further delays for the Camaro Z28? Autoweek magazine is reporting this week that GM has disbanded their High Performance Vehicle Operations team effective Wednesday, February 18, 2009. Per GM's Vince Muniga, All high-performance projects are on indefinite hold, all effected engineers have been redeployed to work on other projects. Vince goes on to say this program could be reinstated once GM regains their financial health. Regarding the Camaro SS or Corvette models, GM spokesperson Vince Muniga has addressed this concern. He has told InsideLine; "You've got the Camaro SS coming out. It is not threatened at all and will be coming out as planned. 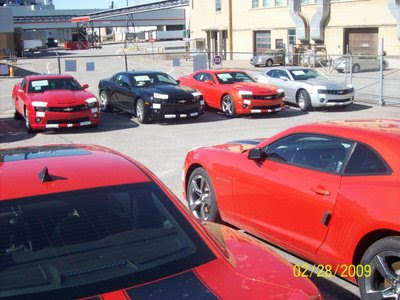 The Camaro SS, Corvette ZR1 and Z06 were all developed as regular production models, and not through the HPVO unit. Hence, all of these vehicles are safe". We've driven the base, V-6-powered 2010 Camaro, and we're impressed. Actually, we're more than impressed. At first acquaintance, the entry-level version of Chevy's 21st century ponycar looks and feels a winner. It's smooth, quick, and accomplished on the road, with great steering, nice chassis balance, and good grip, even on the standard 18-in. wheel/tire combo. We can't wait to drive the V-8. But with the hassle of high gas prices, the looming threat of the new 35-mpg CAFE laws, the worrying knocks from the engine room of the American auto industry -- all the stuff that has the doomsayer enthusiasts pining for the good old days -- this new Camaro got us thinking: Who needs a V-8? We haven't had the chance to track test a new Camaro yet, of course, but this is what we do know about the numbers: More than 300 hp under the hood; a 0-60-mph time of at least 6.1 sec or better; EPA fuel consumption numbers of 18/26 mpg; a price tag of around $24,000. Independent suspension all round. Disc brakes all round. Alloy wheels. Available six-speed manual or automatic transmissions. 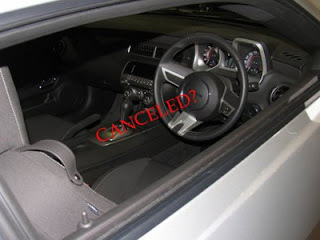 Due to the economic conditions at General Motors, it appears they have recently cancelled plans to produce a Right Hand Drive version for buyers overseas. Reportedly, they will send about 100 Left Hand Drive models to the UK to keep the car qualified for type/approval regulations. GM may also limit sales to the 422 HP SS model at a price of $50,000 USD. 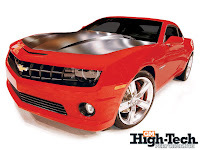 Lingenfelter is currently in the process of development work on several engine packages for the new 2010 Camaro. The first Lingenfelter packages will be designed to be installed in the Camaro SS equipped with either the LS3 6.2 L engine with Tremec six-speed manual transmission or the L99 6.2 L engine with Hydra-Matic 6L80 six-speed automatic. The new 2010 Camaro engine packages will include the Lingenfelter 3 year / 36,000 mile warranty, Lingenfelter badges & certificate of authenticity. Customers can select additional upgrades during the package install including custom coil covers, interior upgrades, wheel/tire packages plus more. As the engine dyno testing is completed on each new package Lingenfelter will release engine dyno sheets, pictures & dyno videos. Lingenfelter expects to have the first engine on the dyno in the next few weeks. Along with the new engine packages Lingenfelter has many other exciting products planned for use on the new 2010 Camaro. Lingenfelter will be releasing information on new 2010 Camaro items as soon as product development and testing is completed. The 2010 Camaro was chosen to pace the 2009 Daytona 500! 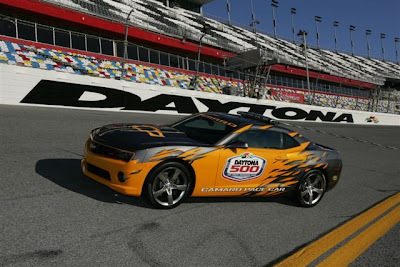 DAYTONA BEACH, Fla. (Feb. 7, 2009) – Daytona International Speedway officials announced the return of the Chevy Camaro as the Official Pace Car of the 51st running of the Daytona 500—the first Camaro to pace the field since 1969. The 426-horsepower vehicle, powered by the 6.2-liter all-aluminum Chevy V-8, carries a PPG Cyber Grey paint scheme with a bold accent design befitting “The World Center of Racing.” A Camaro has paced the field just twice in Dayton 500 history, in 1968 and ’69, and this 2010 model is scheduled to hit showroom floors this spring. Amy Isenhour's first car was a 1965 Ford Mustang, who knew her passion for classic cars would evolve to her collection of '60s themed custom handbags. 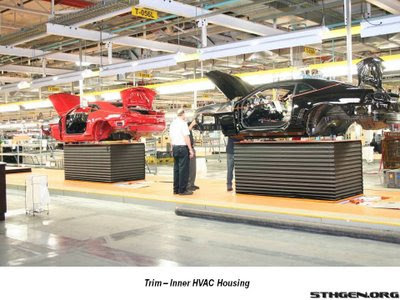 How long have we waited to see something like this, new Camaro bodies on the assembly line! GM has provided 5thgen.org with some very nice internal images of Camaros being assembled in Oshawa, click HERE to see all of the images.